Eat Lead: The Return of Matt Hazard takes bits and pieces from other games and combines them with a clever and hilarious story. 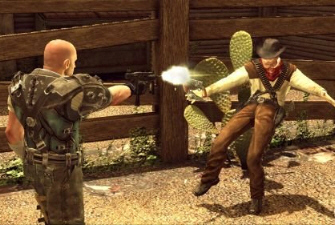 From Wild West cowboys to space marines, you will encounter a wide range of enemies. So, with all the other FPS and TPS titles out there, should you bother with this game? Or just let this fade off into obscurity? The story for Eat Lead is both interesting and funny. Matt Hazard is a professional video game character, and back in his prime he was the ‘It’ guy, and everything he did was epic and sold well. From that success, he signed a lifetime exclusivity agreement with Marathon Megasoft. Finally the success went to his head, and when he started doing games like Matt Hazard Kart Racing, his career finally hit the wall. Fast forward some years later when Matt is an older guy. Marathon Megasoft has brought in a fresh, young CEO and he wants Matt to star in a brand new game. Having been in the hole for so long, Matt is more than eager to get his feet wet again. The game play begins with a tutorial where Matt complains the whole time. As you can guess, he’s been doing this for years and apparently knows how to do all these things. You actually start to believe his comical tirade until the end of the first level. It’s here where you encounter Sting Sniperscope (an obvious parody of Arnold Schwarzenegger) who tells Matt that his time is over, and Sniperscope is the future. Right before Sting Sniperscope hits Matt with a bullet the game pauses, and suddenly you hear a woman’s voice. 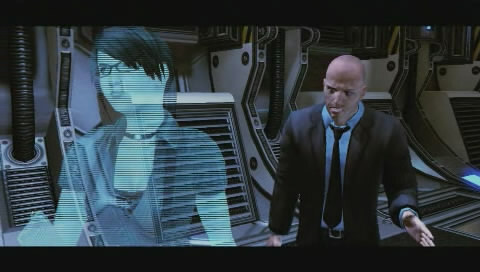 The woman is known as QA and she comes in and tells Matt that someone has hacked into the game and is trying to kill him. Oh yeah, and if he dies in the game he will be lost forever. Things suddenly get serious and Matt must fight his way through each level, fighting off waves of enemies trying to find out who wants him dead/deleted. Throughout each level, Eat Lead does a fantastic job of keeping you on your toes, with plenty of parodies of classic games and movies. 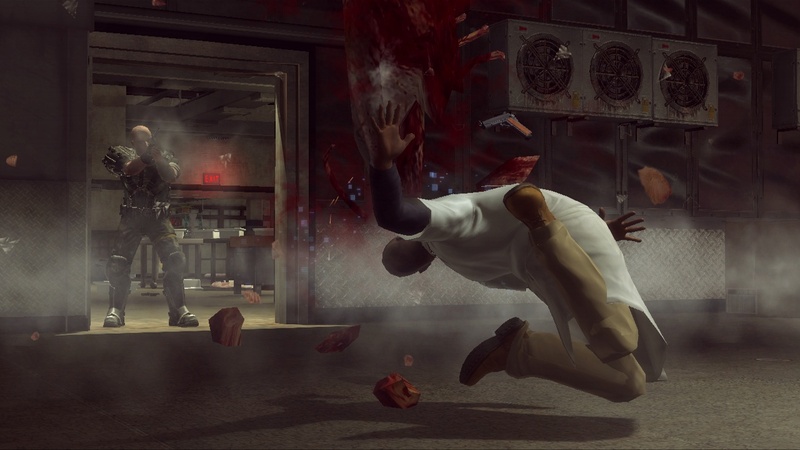 For example, the second level starts out in a butcher shop, which seems normal enough. But once you make your way outside, the game starts to glitch up. And instead of alleyways, you are suddenly in the old west. And enemies from Matt’s previous games with six-shooters in hand are after him. The enemies stand out a lot from each other, and include Russian solders in night clubs, water gun wielding enemies (from Matt’s only kiddie game, called Soak’Em) and even some 2D characters from Matt’s very first game. All of these elements add up to a very enjoyable and often unexpected experience. The game play is very similar to Uncharted. You travel from area to area, fending off waves of enemies and making use of cover. You snap to cover by using X, and can lean around cover with the analog stick. Left and Right on the D-Pad switches between your two weapons, and Square controls hand-to-hand combat. The controls are implemented rather well, but pales in comparison to Uncharted. While there’s plenty of variety to be had with the settings and enemies, the actual game play stays the same all throughout. There are no platforming sections, and no puzzles to solve. Even though it’s a bit unfair to compare this game to the likes of Uncharted, it feels like Eat Lead could have benefited a lot from some game play variety. 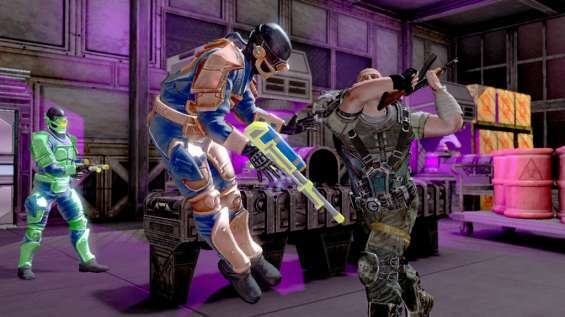 Your arsenal of weapons include the usual shotguns and machine guns, as well as the unexpected water guns that pack quite a punch. You can only hold two guns at once, so this makes decisions hard on whether to go for the big powerful gun with five shots or keep the lighter less powerful gun with a ton of ammo. Besides Matt’s usual weaponry, you can also acquire power-ups. After you kill a few enemies, your power meter will fill up. From there, you can press up to activate the freeze power-up, which will turn your enemy into a ice cube with one shot from any gun, or press down for the fire power-up which will set your enemies on fire. Both deal a large amount of damage, which helps out a lot in the later levels. On top of these two power-ups, which you have access to at all times, there are two others that are spread out through each level. One is a shield, giving Matt invincibility for a short period of time. The other is a super powerup, allowing Matt to kill enemies with a single blow, or a single shot. The graphics for Eat Lead aren’t bad, but there really isn’t anything spectacular either. 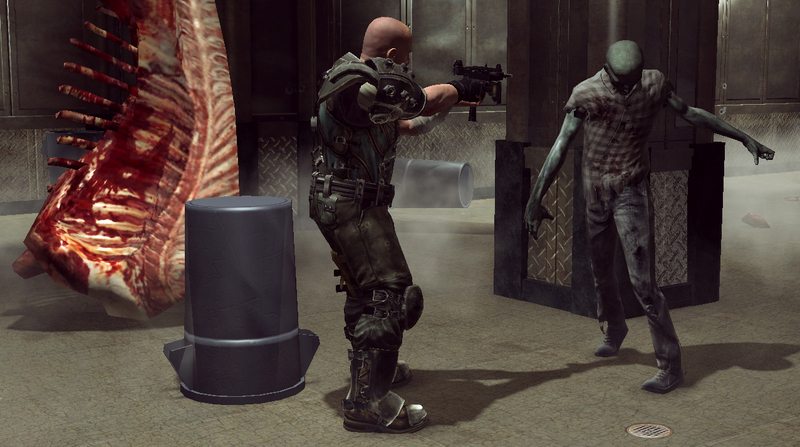 There are about 10 – 12 enemies that you will encounter over and over again. And although some of the environments are very detailed and colorful, there ends up being a lot of corridor fighting so expect to stare at a lot of blank walls. The voice-over for Matt is done by Will Arnett, and Neil Patrick Harris is the voice of Wallace Wellesley, the man who’s trying to kill Matt. These two characters were done well, but there’s not much outside of that. The same tired song will be replayed over and over again each level, and the only time it changes is when you clear a room full of enemies. Also, the enemies that are after you all have the same voices. It’s so bad that after the first level, you’ll have pretty much heard every enemy’s lines within the entire game. In addition to the lackluster audio and visual work, there’s some other issues. They should have spread out the different enemies a little better, since after level 3 or 4 you’ve pretty much seen them all. Because the game consists entirely of shooting, running from room to room gets old quick. It really did feel like the developers threw all their hard work into the beginning, and simply overlooked the rest of the game. The only highlights I could find were the boss battles, which did require some skill to complete. Another big issue is the lack of multi-player. The campaign takes roughly 6 to 8 hours to complete, and after that there is little reason to go back. There aren’t any collectibles to pick up, and no bonus material to unlock, so unless you’re a trophy whore don’t expect any replay value from this game. 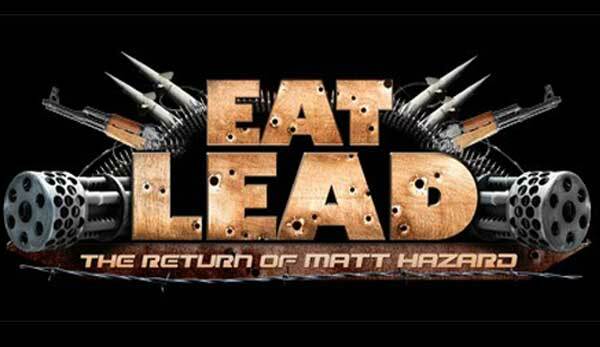 Eat Lead: The Return of Matt Hazard was enjoyable at times, with an amusing premise and often hilarious story. And even the enemies can bring back memories of relic action games from older game consoles. The idea itself had a lot of potential, but it just wasn’t executed very well. The short length and lack of re-playability really hurt the overall score. And unless you want the trophies, there’s not much reason to purchase this game. Poor graphics and audio work. Repetitive due to lack of gameplay variety. Innovative premise that’s comedically nostalgic at times.